Many undiagnosed men and women with Aspergers and High-Functioning Autism are married with children. Some manage adult life very well, while others have significant problems. Living with an Aspergers spouse (or partner) can be very challenging because of the very subtle nature of the disorder. There are no physical signs from just looking at an “Aspie,” and it can be hard to explain to family, friends, and coworkers that his or her odd behavior is not intentional. 1. Aspergers can be viewed as “a disorder of insight into the thoughts and feelings of others” (also called “mind-blindness”).Thus, it may be very difficult to engage your “Aspie” in the types of dialogue that marriage and family therapists use. These professionals may not have dealt much with partners affected by Aspergers and may need information from you in order to avoid misunderstandings. Also, it may be more useful to talk to a therapist on your own in order to have a chance to think through your feelings and decide potential coping techniques. 2. Aspergers is a complicated disorder. Thus, it is important that support is informed and understanding of these complexities. There are support groups available that can be very supportive. The benefit in talking to someone who understands should not be under-estimated! 3. Avoid personal criticism. A more impersonal approach in dealing with your Aspie will work better (e.g., instead of saying, "You shouldn't do that" …say, "Most people don't do that in social situations"). 4. Have contact with other neurotypical spouses/partners in the same position for understanding, listening, support and advice. 5. If your Aspergers spouse acknowledges his or her social difficulties, it may be useful for him or her to see someone who knows about autism spectrum disorders and who can offer practical advice and social skills training, rather than “insight-oriented” talk therapy. 6. It may be hard for you to understand your Aspergers spouse’s needs. He or she may be interested in things that seem very boring to you, or may find seemingly normal social situations very stressful. Remember that he or she may not be able to read all the social cues that you understand without even trying. Thus, getting very upset may not be the best way to get through to your Aspie. A calmer, reasoned discussion – even writing things down – will work better. 7. It may be hard for your Aspergers spouse to change from routine; therefore, he or she may need plenty of notice when such disruptions are going to occur. 8. Know that you are not alone (although it may feel that way a lot). Use what help is available, through a support group or therapy. 9. Learn as much as you can about autism spectrum disorders. The apparently “hurtful” behavior by an Aspie may not have been meant that way, but may be due to an inability to read the NT’s thoughts and feelings. In telling your Aspergers husband or wife what you are thinking and feeling and what you need him or her to do in response, be very frank and explicit. 10. Many NT spouses feel overly responsible for their Aspergers husband or wife. Acknowledge that there is choice connected to that responsibility. If you choose to take on responsibility for others, decide on how much and when you feel it is appropriate. 11. Often times, neurotypical spouses spend so much time looking after others that their own needs are not acknowledged by themselves – or others. Decide what you want and how you can get it (e.g., where you can go for conversation, support, etc.). Take time to pamper yourself and reduce your stress. 12. The realization that one’s spouse has Aspergers often comes about when a son or daughter receives the diagnosis. This occurrence may be compounded with guilt and a lack of support from your Aspie. Taking time to talk through positive coping techniques with a professional will be paramount here. The feeling of not being able to change things can be overwhelming. Thus, look at the situation objectively and decide (a) what can change and (b) what will remain constant. 13. Understand that all the unwritten rules of behavior may be very confusing to your Aspie. Something that you think is obvious may not be to him or her. Aspergers spouses/partners may not be able to project their mind into a hypothetical situation or put themselves in someone else's shoes. They may not immediately recognize the needs of others. And they may have a lack of perception about other people's motives. But bear in mind that this is largely due to “mind-blindness” issues rather than blatant selfishness. 14. 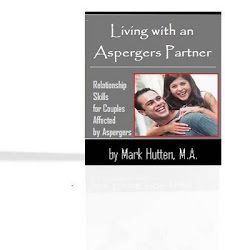 Understand that in many cases, the Aspergers spouse is simply not going to "get better" or be transformed into the husband or wife you thought you married. Even so, certain behavior can be modified or changed, which can make daily life less stressful for both you and your Aspie (e.g., establishing routines and agreed timetables, looking at how you talk and what language is used, etc.). 15. When communicating with your Aspergers husband or wife, don’t be vague or assume your wishes will be acknowledged and understood. For example, it may not be enough to remind your Aspie that you are having family over for dinner. You may need to go through the evening in great detail (e.g., “I need you to help me with _______” … “I want you to greet everyone as they arrive” …"I would really appreciate it if you did not go to bed before the guests leave" …and so on). Aspergers: Disability or Unique Ability?